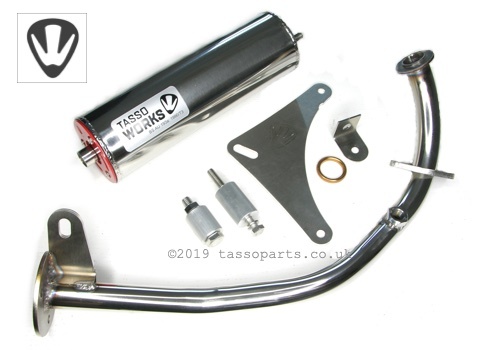 Following our infamous RIP exhausts, our stainless steel design, laser cut support brackets and one piece downpipe with improved bore diameter to enhance scavenging. Great sound and striking looks. With kick out muffler taking style from the lambretta 2 stroke exhausts. Our unique one piece Tasso muffler is made from high quality 304 Polished Stainless Steel with Internal removable DB filter. Lambda Sensor boss fitted. Shipped set up for standard engine so you can bolt on and go. To optimise performance we recommend re-jetting and fitting air filter to maximise performance. Other performance upgrades also available. LIMITLESS ECU REMAP - All standard factory settings are kept, just the RPM/Speed limiters are removed. This remap is ideal for customers who want to keep within the factory settings but enjoy some extra top end. Ideal compliment for people that want to enjoy some extra juice from their Tasso Exhaust.